Unlimited trick to get duo scratch card on Google pay. Google Duo is the highest quality video calling app. It’s simple, reliable, and works on smartphones and tablets. Pick a loved one and jump right in, with a simple interface that makes video calling as easy as one tap. You can earn upto Rs. 1000 from a single card. You just have to invite your friend. When your friend installs Duo app and makes their first call, you both will get scratch card. One person can earn maximum 30 scratch cards. There’s no fixed time to when this offer will end. Offer will continue till supplies last. So, hurry up and avail this offer asap. Unlimited trick to get duo scratch card on Google pay. 4) This link will redirect to chrome webpage then click redeem button there and this button will redirect u to Google Duo app. 5:) In mobile number enter any number .###You CAN ENTER ANY NUMBER LIKE USA NUMBER from Txt now or 2nd line. REPEAT ALL STEPS FOR getting new SCRATCH card..
First of all, download and install Google Duo app from here. Open app and give permissions that it asks for. Register with a new number in the app. Verify number using OTP. Now, go to Menu>> Settings and add your Google Pay email in Google Duo app. Comeback and go to Menu>>Invite Friends. If you are eligible, you’ll see something like this. Click on Share invite link and start referring your friends. If you can’t see this option then please wait for it to appear. If it still doesn’t show, then you’re not eligible. 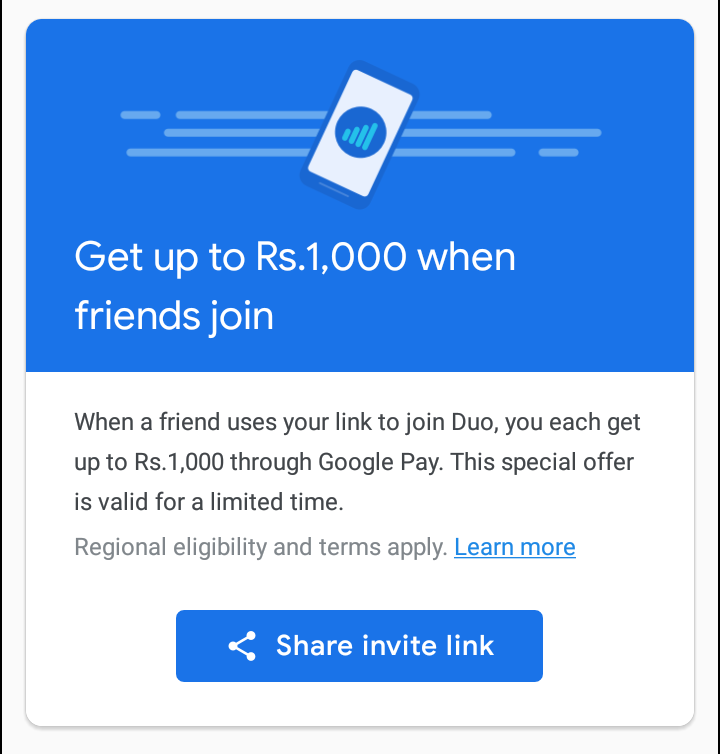 Users having pre-installed Duo app aren’t eligible for this offer too. Tell your friend to download the app from your link and register with new number. You both will get scratch card when he makes his first call on app. Open Google Pay, go to Rewards. Here you can see your cards. Scratch them and try your luck. Amount that you get in scratch card will be automatically transferred to your bank account.